More and more we are learning about the benefits of being able to work from home. Employees note reduced stress due to eliminating long commutes and employers note less absences and more productivity. 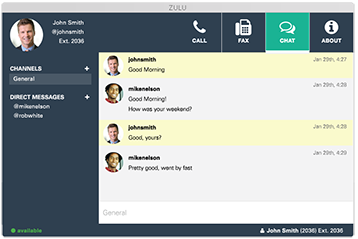 If you would like to integrate the option for your employees to work from anywhere– home, office or on the go– then check out Zulu UC Desktop Integration! Zulu UC Desktop Integration was designed specifically for Pulsar360 and optimizes business communications to improve employee productivity. With the Zulu Softphone, users will be able to make and receive calls from their desktop and mobile devices. Soft phone also includes chat, SMS and faxing and the ability to see whether other staff members are available through Presence. Since calls are possible right through your desktop you can easily click to place or allow calls directly from the web browser as well! Finally, with Call Pop, if you are running a help desk or CRM, easily see the information of a caller coming through Zulu on your browser to quickly and easily provide the best customer service. All of Zulu’s features can be controlled from your Pulsar360 phone system, and can be customized at user level. All features are included in standard pricing, and are available in 20-seat packages, making it scalable and budget friendly. Plus, since Zulu is compatible with MS Windows, MacOS, Linux, MS Outlook and Google Chrome, anyone can take advantage of all of these incredible features.